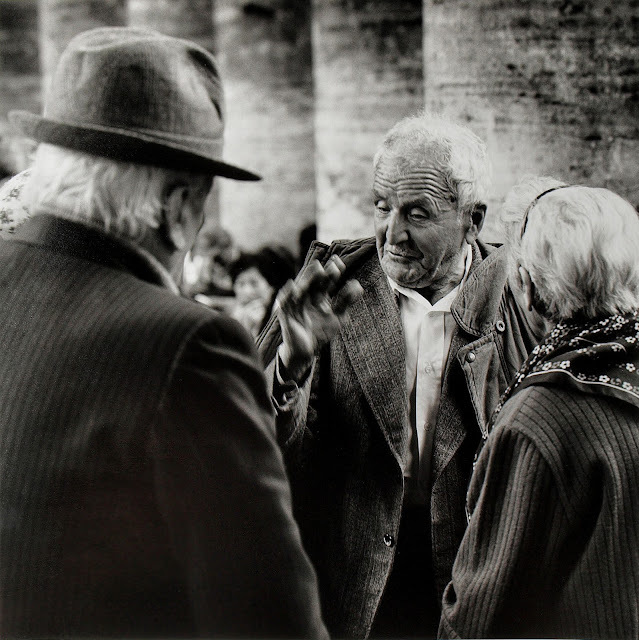 The Visual Science Lab / Kirk Tuck: Hanging out at the Vatican, taking images of the non-tourists. The normal lens means you're close. Hanging out at the Vatican, taking images of the non-tourists. The normal lens means you're close. It was always interesting to shoot black and white film with a medium format rangefinder camera, out in the streets. Interesting because there was no way (other than the experience module in your brain and the depth of field scale on the lenses) to know how the image would look. The rangefinder window on the Mamiya 6 cameras showed an images that was as much in focus as your eyes could see. The center weighted meter got one onto the the target but you had to use your experience and observation skills to get exposure closer to the bullseye. And if you got everything just right you still ended with a negative that had to be matched to graded papers and interpreted in just the right way to get the look that you had in your mind's eye in the first place. We digital users forget (or never experienced) the fact that the time elapsed from taking the photograph to actually seeing the first indications of what you actually got could be separated by days, weeks or even months. There was, for the most part, no immediate feedback loop to guide you in iterative steps to a better image --- in the moment. It was a wet and rainy October day in Rome when I walked over from my hotel near the Via Veneto to the Vatican complex. It was the middle of the week and the kids were at school; their parents at work. When I got there the area in front of St. Peter's Cathedral was packed with senior citizens, gathered around their church banners, talking and debating. In my old pants and a vintage sport coat I mixed with the crowd and looked for images I wanted to take. I pulled an old, incident light meter from my pocket and made a general reading for the area. The overcast light never changed. I ignored the camera meter and set my exposure controls based on the meter's indication. I kept the lens focused to around 10 feet which put me into a useful zone which could be quickly fine tuned when I put the camera up to my eye. I was working with a 75mm lens at f5.6 and there is surprisingly little depth of field there. The ISO of the film was the limit and really couldn't be changed half way through the roll without sacrificing what was already on the roll. You adapted by using a slower shutter speed and bracing yourself; paying attention to your handholding techniques. On sunny days, out in the streets, you could shoot at f8 or f11 and this allows you to pre-focus even a medium format camera and get good images. The benefit of pre-focusing is that when you see a scene you want to capture you need only lift the camera to compose and then shoot immediately. Most of use learned just about where twelve feet in front of the camera was, more or less. This yielded a photographer a certain invisibility that seems to have faded over the years. I spent the better part of an afternoon wandering through an ever changing crowd just looking and absorbing the feeling and mood of the participants. Time well spent as I became, over time, a fixture to be overlooked. Perfect.